The storm spoke through him. "These are the cleansing tears of your ancestors. The life-giving drops of the world. Water falling from the sky. A miracle of particles. Listen to my wind. Hear my voice. Words lash out in bolts, binding reality to their whims. Are you thirsty for life? Drink of my wisdom little one. You are no different than I. We are all consciousness, we all have parts to play on the stage. Dance in my love. Open your heart to the sky and be full. You have never been empty. Emptiness doesn't exist. Fullness won't allow it. Thunder, rolling lazily across the mountains. Animals seeking home. Plants reaching to the sky. There is nothing we haven't been. Don't limit yourself to the external storm. Snuggle into the void. Find comfort in the ultimate freedom of mystery. Love all, release all. Have compassion for others from whatever distance you need. Claim nothing as your own and all as your relation." The first time I opened The Hero With A Thousand Faces I got about 120 pages in and stopped cold. I picked it up again 2 years later, and it alternated between delivering inspiration for stories and just plain blowing my mind. I've read it three times now and almost every page is dog-eared and many sections are underlined. What changed? I was able to look past my old meaning of God, allowing me to see Campbell's brilliance in explaining the challenge we face today as individuals in a society built against our nature. Campbell talks a lot about God in all the forms the idea takes, and you will have to get past your meaning on either side. Here's a passage that should help you get around that word if you're worried that reading anything that has the word God in it means you believe in the Christian doctrine. It'd be a shame if you let that keep you from the secrets in this book (and others). If that offends you, don't take it so hard. The idea of God has been around a lot longer than society has used that word for it. It's an attempt at telling the story of existence, it's bigger than Christianity or any religion. 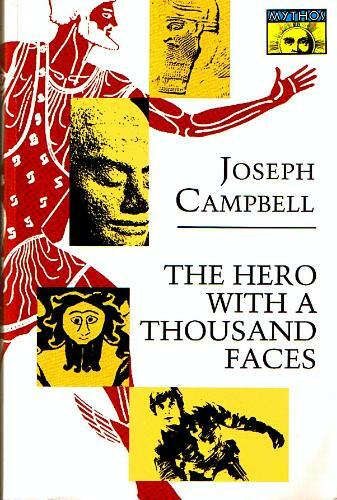 Campbell begins with the introduction of the Monomyth, 'the one, shape-shifting yet marvelously constant story ' that we find in the heart of all stories, 'together with a enchantingly persistent suggestion of more remaining to be experienced than will ever be known or told.' It's born from our culture's myths and dreams, lost or found in the tragedy and comedy of our lives, acted out between the heroes (you) and the gods (also you), and kept alive through eternity by the continuous creative force of the World Navel. This sets the stage for The Adventure of The Hero. Campbell walks you through specific steps like The Call to Adventure, The Road of Trials, and The Crossing of the Return Threshold using examples from myths around the world. Then he steps into the nature of the universe in the sections on the Cosmogenic Cycle, which are particularly fascinating. Summing up this book in short order is harder than most. It is dense, like neutron-star dense. You could write full-blown essays on any number of sentences or paragraphs throughout the adventure. My favorite section comes in his brilliant summation of it all. This is to say that our collective stories have run out of power and we have replaced them with empty versions, a black and white reality that stands in defiance against the natural world. The challenges facing the hero used to exist past the edges of society. Stepping out of society was part of the journey, but culture wasn't the monster to be slain. Society and culture were largely on the side of the hero, even though tyrants sometimes had to be killed. In our day, the challenges are society and culture themselves. Our stories and myths are the monsters that must be defeated to find ourselves. The monsters no longer wait outside the edges of the campfires, hiding in the woods. They are inside of us. They are our rituals, our religions, our beliefs, and the controlling structures of distraction from truth that hold our society together. If you're to find yourself in today's world you must live a life that defies the stories that make up the fabric of our civilization. You must cast off meaninglessness and resist coercion to buy into the lies and confusion with your entire being. The modern hero has to travel underneath our culture's misunderstanding of what it means to be human and find secrets to set themselves free, and hopefully in turn, others. We each have to write a new story about ourselves and our world to realize our full potential, and nothing is more difficult or more essential. If you don't spend a lot of time imgur, you miss some things. A lot happens with 130 million+ monthly unique visitors and 4.5 billion monthly page views. Like GIF battles, struggles over NSFW rules, work stories, memes, and advertisers (WarnerBrosRecords) getting downvoted into oblivion when they try to get in on those sweet, sweet page views. The post in question: <a rel="nofollow" target="_blank" href="http://m.imgur.com/gallery/dGCNGA1">http://m.imgur.com/gallery/dGCNGA1</a> -43,000 and counting!! @WarnerBrosRecords joined imgur just this month and is already one of the most hated accounts with -57,735 reputation and the "Forever Alone" notoriety. Part of it was due to one of their posts that made it to the front page, which could have only gotten there by paying for it, and that pissed the community off. So much so that WarnerBrosRecords has almost caught up to one of the most hated imgurians from last year. Banana for scale. ...And an honorable mention to your top rated comment! An astounding -30 rating! Who cares? Probably lots of brands trying to hack the imgur community, maybe some imgur users like myself who think it's funny when ads get downvoted to hell. I found it amusing and instead of writing some "what brands can learn about imgur advertising from @warnerbrosrecords" article which I don't have time for or care to write, I just thought I'd share this quickly because it pleases me. Brands, if you want to be a part of the community you have to be a person. So, that means you either need to hire a person to spend all their time on imgur, actually engaging the community, or hire someone who already has the clout. Either way, the community will still know when you're pushing product disguised as content. There's a chance you could get a community member to be so well-loved that they might be able to slip in a good word here and there, or do it subliminally, but it's way more complicated than you're probably willing to commit to. It won't look like any advertising you've ever thought of. Communities like imgur and reddit (where imgur gets most of its traffic) are like immune systems that fight and kill marketing efforts on sight, good luck. You could also make the bad press = good press argument here. And one actual strategy would be to become the community's play thing. Maybe after you've taken enough shots, you could win them over ... Maybe. Long ago, a storm ripped a boy's heart from his chest and shattered it against the Cliffs of Forgetting. The wind scattered the pieces across the multiverse, creating a scavenger hunt out of eternity. He dove into lifetime after lifetime to find the pieces. Picking up a crystallized splinter here and a glimmering shard there. He walked many lonely paths through the darkness to remember he must look for reflections in the light. The pieces returned in unexpected moments. Revelations jumped out from around corners he believed to be walls. Loves were found, acknowledged, and ignored. The story of each world whispered his steps along the path. He began to remember how to listen for and see them. One day, he would hold every piece and ages after that, he'd begin his search anew. And maybe, somewhere along the slipstream of eternity, he'd realize that nothing had ever been lost, that he had always been whole. It’s fitting that I managed not to realize Ray Bradbury was dead until finishing Dandelion Wine for the first time the other night. Fitting because this gorgeous web of stories is about a boy who realizes he’s alive for the first time in the summer of 1928, only to realize that because of this great gift, we all must die. Dandelion Wine exposes the fantastic possibility contained in “ordinary” life and transports you to another time and place. It’ll pull up ghosts from summers past and inspire something new in you at the same time. Whether you know Bradbury or not, his words have shaped corners of the world you live in and will continue to do so long after his death—and yours. If you're alive, it's a must-read. The summer opens with two young boys collecting grapes and berries in the woods with their father. They have tin pails and Douglas, the older of the two brothers, feels a looming presence in the woods. Something big. A primeval force coming toward him. While his brother, Tom, is seemingly distracting Douglas from what’s approaching, they get into a fight and Douglas gets blindsided by the mysterious force—both of them ending up on the ground. “And at last, slowly, afraid he would find nothing, Douglas opened one eye. The world, like a great iris of an even more gigantic eye, which has also just opened and stretched out to encompass everything, stared back at him. And he knew what it was that had leaped upon him to stay and would not run away now. From there, the summer expands into a delicate fullness that runs away when you try to grab on to it. Fireflies and happiness machines, lost friends and deaths, soulmates, love, and ice cream—Bradbury leaves no stone unturned. Like life, his fantastic summer is captivated by the exquisite dance of tragedy and joy. The ebb and flow of what it is to be alive in all of the brightness and shadow in the world. This book is a playful reminder to be present with the luminous beauty hiding in plain sight. It's all around you—even in the darkness. As I sit here eating this sandwich, overflowing with happiness, I think about how I would like to eat this sandwich forever. But it's not the taste of the medium rare tuna, topped with the perfect mushrooms, and some divine mystery sauce that's lighting me up. It's the flavor of awareness. Eating this sandwich forever would quickly lead me to get tired of it. It's the temporary nature of experience that makes it so sweet. The unique configuration of this moment, and every other. And, it arises from the inside, the joy comes from the awareness itself. Why would I wish to always have the experience of the sandwich when that would make me sick of it? Because I attribute the feeling to the external trigger, not the source of the feeling itself. That's the trap for us, confusing the triggers of the experience with the experience of awareness itself. We want more triggers—more sandwiches—but if we take the time to look at what's underneath, we don't need so many triggers to remind us. The Oasis Cafe in Salt Lake City was busy, and at first I felt assaulted by the experience—especially the loud girl at the next table talking about her business. But I quickly reminded myself how blessed I was to have the opportunity to eat such a wonderful meal. I imagined myself surrounded by a bubble of light to contain my energy and keep from soaking up everyone else's. The experience quickly changed from assaulting to wonderful and I started reading The Joyous Cosmology by Alan Watts while I was waiting for my food. Reading deepened my awareness, helping me remember the truth that nothing is "right" or "wrong", it's all just awareness experiencing itself in different flavors. That the girl talking incessantly about her new business was young and simply excited to be aware, not annoying and loud. It's all how I chose to label the experience. She was an expression of the whole and she had a great purpose to serve—even if either of us never knew what it was. We spend most of our time at odds with the ever-changing nature of our own personal experiences; fighting the space between triggers of happiness, labeling them as painful, boring, or wrong. Fighting against external configurations that don't have the ultimate say about how we feel. We forget that eating the sandwich forever, to only do the things that make us happy or joyful all the time, would eventually lead to boredom or suffering. These triggers simply open us up to our full, unbounded experience in the moment. The bliss is already there, you're just playing like it's not because the game is more fun that way. Seeing this and remembering it takes a ridiculous amount of practice because the whole world around us is doing its best to forget its true nature. That every moment is as full and perfect as any other. That the sandwiches are doorways to an experience that's always there. We act like it's not because there would be no game to play if everyone was in on the secret. So if you're in on the secret, you really have to work not to be fooled. But the more you work at it, the space between being fooled and remembering gets shorter, because you start to realize that the space between isn't actually there. That every moment is as full and perfect as the moments you label as the highest in your life. No matter what you believe, you're a creature made of particles and the elements of stars who's dodging comets and global disasters without even knowing it. You're a part of a civilization that for all of its horrors has also created great beauty. You get to experience a view that will never exist again, in every single moment, and you get to choose how you experience it. The sandwiches only jog your memory. In this book Alan Watts explores the foundations of what it means to exist in disconnected society and proposes a new viewpoint as part of the solution. So, who are you? What aren't we supposed to know about who we are? That you're it. You're what the word God tries to express and fails to do in myth and metaphor. Your experience is simply the universe exploring what it means to be you and the whole of existence is in support of your exploration of free will. Deep down, you're an expression of the whole universe; the unfathomable and eternal consciousnesses that lies at the center of every life form and object in existence. And so is everyone else. The people you love and the people you label as evil. We're all it. You're just playing that you're not so that the universe can know what it's like to wear your personality; to taste the unique flavor of your life and experience; to feel your loves, horrors, victories, defeats, and everything in between. You're the essence that every religion ever imagined has tried to capture through metaphor. And why does shifting our view and changing our experience of "I" matter? Because we're distorting reality with our current view. 'We do not "come into" this world; we come out of it, as leaves from a tree. As the ocean, "waves," the universe "peoples." Every individual is an expression of the whole realm of nature, a unique action of the total universe. This fact is rarely, if ever, experienced by most individuals. Even those who know it to be true in theory do not always sense or feel it, but continue to be aware of themselves as isolated "egos" inside bags of skin. At only 160 pages it's a quick and fascinating read. Spoiler Alert: Some plot detail is included in this review, but it won't ruin the story for you. 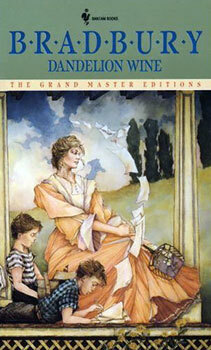 These days, Neil Gaiman is famous for his novels and children's stories. You might have read or watched Neverwhere, Stardust, American Gods, The Graveyard Book, or Coraline—but Gaiman's first masterpiece was The Sandman. This graphic novel epic was released over 75 DC Comics issues from January 1989 to March 1996 and Vol. 1 includes the first 8. In Preludes & Nocturnes, you'll find eight intertwining stories charged with myth, loaded with the infinite possibilities of dreams, and shaped by the dark tides of nightmares. We meet Dream of the Endless in the era of World War One in the basement of a manor in Wych Cross, England. Captured in a ritual meant to imprison his sister, Death, the world loses its balance with the Prince of Dreams missing from his seat of power. People fall asleep never to wake again and others are driven mad when sleep refuses to come to them. He waits in silence for a lifetime as his captor grows old and dies while the artwork of Sam Keith, Mike Dringenberg, and Malcom Jones III, colored by Daniel Vozzo, and lettered by Todd Klein brings a vast new world to life. Morpheus, Dream of the Endless, eventually frees himself and must recover three objects of power that were stolen from him—a pouch of sand, his helm, and a ruby. Morpheus calls on the three ladies, the Hecateae, to ask them where he can find his talismans. You'll find these ladies throughout the series and they're always a treat. Dream learns his objects are scattered across the mortal plane and one is in the possession of a demon in Hell. First, he meets John Constantine (yup, the DC character which the movie featuring Keanu Reeves is based off of) and bluffs his pouch from the grip of runaway nightmares. After that, he steps out of the DC universe and travels to Hell to ask the help of Lucifer the Morningstar to find his helm. Here we meet Dream's former love, Nada, who he cursed to hell 10,000 years ago for a reason left unknown in this volume. He greets Lucifer and is surprised to find a triumvirate ruling over the underworld. They call forth all the demons and Dream locates the one with his helm, but Choronzon, a Duke of Hell, received it in fair trade and Morpheus is forced to challenge him to a battle. It's one of my favorite parts of the first volume and the page below is a taste. 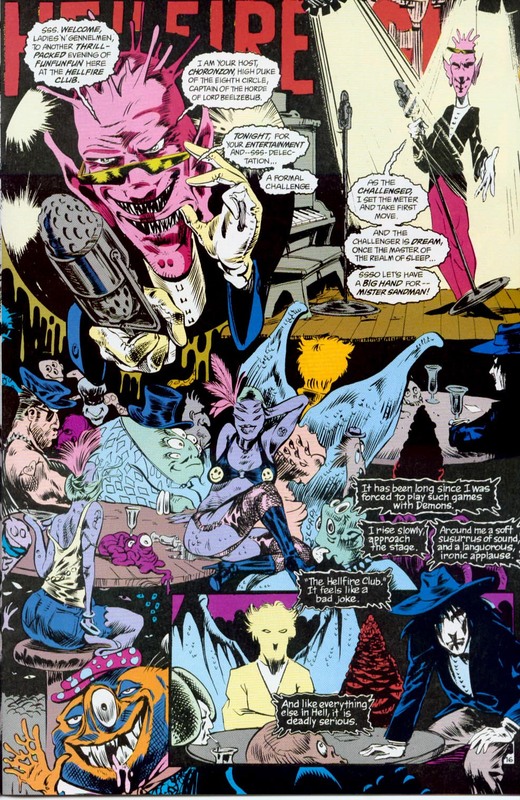 After the challenge, Gaiman takes Morpheus deep into the DC Comics world with both the familiar Arkham Asylum and the League of Justice playing a role in the story. 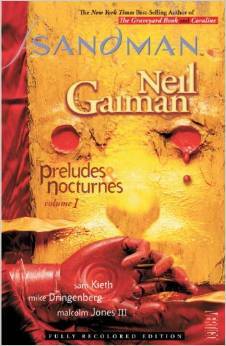 He quickly leads the reader into the heart of nightmare with 24 Hours, likely the darkest issue in the whole series. 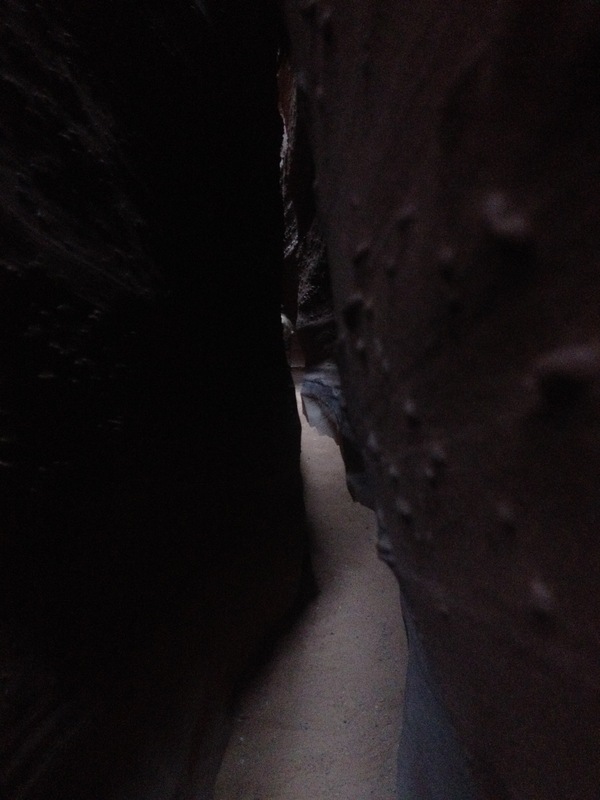 In fact, this is one of the darkest corners of the imagination you'll find in any story, ever. The villain in possession of Dream's ruby uses it to convince a group of people in a 24-hour diner to dismember themselves and each other while a T.V. shows news highlights of a world going insane. You'll find plenty of darkness in the rest of the series, but it's more directed, purposeful, and somehow lighter. 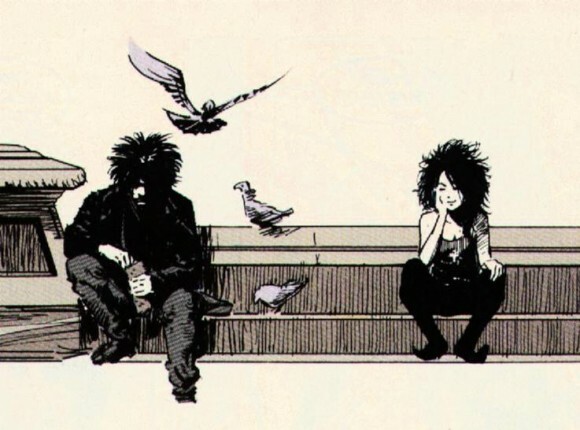 Finally, with all his power back, a brooding Dream is cheered up by his older sister, Death, and Gaiman cracks into the voice for the rest of the series in The Sound of Her Wings. Dream follows Death as she collects departed souls and we get a peek at the inner workings of a family of beings more powerful than the gods. Death has never been so easy to love and understand. This is the beginning of one of favorite stories ever written. It's a tale steeped in darkness—inspired by old fairy tales and myths. There are flashes of love, light, and redemption to be found throughout the series, but they're given shape by the shadows. You don't have to love the dark to enjoy this series, but you have to be willing to feel it squish between your toes. If you're intrigued, it's worth buying the first 2-3 Volumes or the whole set right away, so that you're not stuck in suspense. 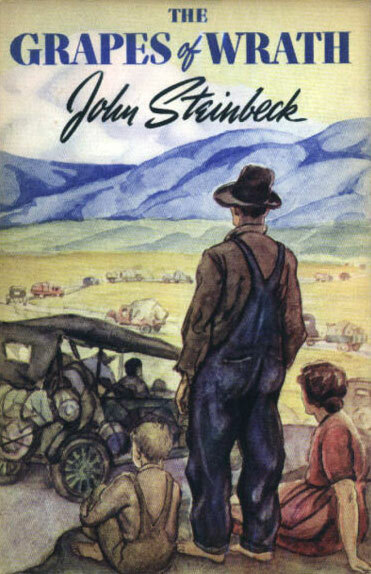 Steinbeck's Pulitzer Prize winning classic is one of those books society said I should read which I avoided for that exact reason. Maybe it would have done me some good in my earlier life, but there's no way I would have been able to appreciate its depth. Well, The Grapes of Wrath found me recently and it is one of the most powerful, well-written stories I've ever read. Tom Joad returns to his family to find them abandoning their farmland and home, preparing to head to California to find work and build a new life. The whole countryside is being emptied out—the Joads are one of the last families left. Like everyone else, a few years of bad weather and crops forced them to become tenants on their own land by borrowing money from the banks and they can't pay up. The banks want profit, and the tractors, the machines are profitable—families are not. "We know that—all that. It's not us, it's the bank. A bank isn't like a man. or an owner with fifty thousand acres, he isn't like a man either. That's the monster. Sure, cried the tenant men, but it's our land. We measured it and broke it up. We were born on it, and we got killed on it, died on it. Even if it's no good, it's still ours. That's what makes it ours—being born on it, working it, dying on it. That makes ownership, not a paper with numbers on it. No you're wrong there—quite wrong there. The bank is something else than men. It happens that every man in a bank hates what the bank does, and yet the bank does it. The bank is something more than men, I tell you. It's the monster. Men made it, but they can't control it." The owners don't want to kick the families off, but they have no choice. That's the way of the world now. As it was masterfully foreshadowed, the Joads cross the unforgiving desert only to find a California that is hostile to their existence. Not the abundant dream that had driven them. Steinbeck uses their trials in California to explore economic absurdities, workers' rights, and what happens to people when society is forced to evolve at the pace of the almighty dollar. A brutally honest and poignant descriptions of events, Steinbeck doesn't pull any punches. It's no surprise that he was widely criticized for his expression. People don't enjoy looking at themselves so closely for fear of what it reveals about our collective nature and values. 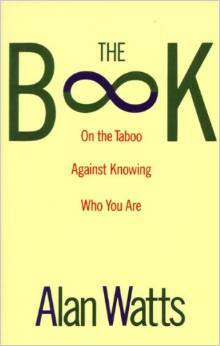 This book is a hard-line into the human experience. A look at the society we've created and what happens to people when the momentum shifts. Loved ones go mad, starve, die, and walk off into the wilderness never to return; and yet, there are bright lights that shine through. Selfless kindness to strangers on the road who are made family by circumstance. The joy and stability found in the simple act of making breakfast every morning when the entire world is crumbling. If you have any interest in the human condition, The Grapes of Wrath is a book that demands to be read—again and again. Ultimately, this book found its way to me through this Bruce Springsteen cover by Junip. It contains part of what Tom Joad says to his mother when they finally part ways and it's a wonderful song. GOVERNOR: Gentleman, we need a desert. GOVERNOR: Gentleman, a desert. A point of savage reference for the good people of Ohio. A place to fear and love. A blasted region. Something to remind us of what we hewed out of. A place without malls. An Other for Ohio's Self. Cacti and scorpions and the sun beating down. Desolation. A place for people to wander alone. To reflect. Away from everything. Gentleman, a desert. GOVERNOR: Thanks, Neil. Gentleman may I present Mr. Ed Roy Yancey, of Industrial Desert Design, Dallas. They did Kuwait. This dialogue is what hooked me. Not because I love deserts, but because of the absurdity of the topic and the brilliance of the personalities in the conversation. The excerpt above is from a longer conversation about what eventually shows up as a well-loved, and uncharacteristically crowded Ohio landmark. Entertaining dialogue continued throughout the book and built an incredible world for the characters to live in. My favorite is probably the businessman who rants about his new goal to become infinitely large by consuming everything outside of him, while he's decimating 9 steaks in a fine-dining restaurant. So good. The core of the story revolves around a family who's gotten wealthy off of the baby food industry. Their connections, acquaintances, loves, and neuroses drive the plot forward and inside-out. 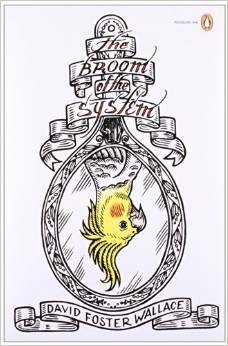 The Broom of The System pushes character development through dialogue and setting to a level I've never encountered before. Even when I didn't know where the story was possibly going, I didn't care. This seeming lack of direction was also one of the themes. "But that stuff about context, though. Shouldn't a story make the context that makes people do certain things and have the things be appropriate or not appropriate? A story shouldn't just mention the exact context it's supposed to try really to create, right?" This book does exactly that. It creates a world out of itself and lets the characters develop as if they were living. It's bizarre and gorgeous. Filled with people like Jay, a meddling psychologist who wears a gas mask when he smells "breakthroughs". JAY: Why is a story more up-front than life? There's no way to classify this as a light read, but it flowed nicely for me and was one of the most entertaining books I've read in recent history. If you enjoy brilliant dialogue, neurotic characters, and not having any idea what's going to happen next, this is a great book for you.